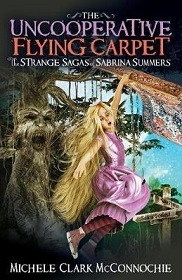 The first in a trilogy, The Uncooperative Flying Carpet tells the story of Sabrina Summers, her brother Rory, and her friends, whose lives are turned upside down when Sabrina's father marries someone she suspects is a witch. Accidentally sent to the strange land of Dralfynia and turned into old-fashioned fairytale characters, Sabrina, Rory, Olive, and Persis must battle bats, witches, and goblins, deal with betrayal and mistrust, and get back home before they're grounded for life. To do that, they'll need to work as a team, but with only an uncooperative flying carpet and a unicorn with gas to help them, will they ever get back to Melas? And when they do, what will they find waiting for them?